I came across the Emsisoft Emergency Kit just in the last few days, which means, I haven’t had a chance to put it through my normal test process. Unfortunately, it’s not very likely that I’ll have the time to do so, for several more weeks. So, in the interest of keeping regular readers up to date as to what’s new in the free antimalware market, the following information is taken directly from the publisher’s site. With the Emsisoft Emergency Kit Scanner you have got the powerful Emsisoft Scanner including graphical user interface. Search the infected PC for Viruses, Trojans, Spyware, Adware, Worms, Dialers, Keyloggers and other malign programs. 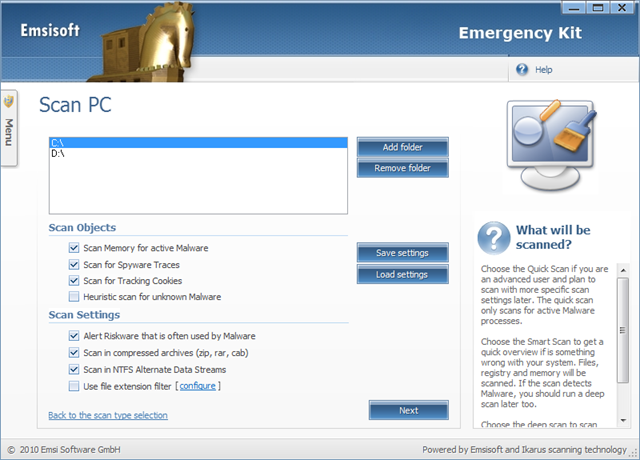 Run the Emsisoft Emergency Kit Scanner with a double click on a2emergencykit.exe. Found Malware can be moved to quarantine or finally deleted. Next is an example to scan drive c:\ with enabled Memory, Traces (Registry) and Cookie scan with active Heuristic module and archive support. Found Malware is moved to quarantine. BlitzBlank is a tool for experienced users and all those who must deal with Malware on a daily basis. Malware infections are not always easy to clean up. These days the software pests use clever techniques to protect themselves from being deleted. In more and more cases it is almost impossible to delete a Malware file while Windows is running. BlitzBlank deletes files, Registry entries and drivers at boot time before Windows and all other programs are loaded. Expand the content of the Emsisoft Emergency Kit to an USB stick and make your own universal tool to scan and clean infected PCs. System requirements: Windows XP, 2003/2008 Server, Vista and 7, full functionality on x64. “full functionality on x64.” Thank God! This is definitely going into my toolbox. Thanks Bill. Yes!!! We finally found one for you. I use A2 antimalware Bill. I like it. Runs well, no conflicts, it comes with HijackFREE for the advanced user. It has apparently a very good malware detection rate. I’ve not used A2 Antimalware personally, but like you, many readers have made the point that this is a very worthwhile application. Thanks for passing on your experience. This is definitely on my list for downloading. Good Liam – this could prove to a very handy app. Just for those who don’t know Emsisoft recently bought Online Armor wich is one of the best (if not the very best) Firewall/HIPS around. They promised to keep the free version of OA, wich I use and recomend. So this news are welcome. Thanks for the update on Emsisoft, Online Armor, and your recommendation. This looks interesting indeed. Will definitely be trying this out, I always like running a number of good quality products to get different opinions. The layered security strategy and all that. Thanks for this. Emsisoft produces some very good products and, they have an excellent reputation. When I went to renew my A2 licence, I noticed that the A2 + OA package was going for 1/2 price. $40. I have a firewall, so passed this time. Thanks for the update. That’s a very cool deal! Man it’s thorough isn’t it. Like you, 0 malware found. I like that number 0. A very cool tool, thanks Bill. I’m thinking – this is a definite keeper. Cool that you came up empty. Nice info about the new scanner. Thanks for this cool post. Tested it someday ago and find just perfect tool for my repository. After owning Online Armor, this company really doing some nice thing for average people. Sorry, but I don’t do link exchanges.